Water damage is typically thought of as a pipe break or flood. However, it doesn’t always take a large amount of liquid water to cause a problem in your home or building. Improper vapor barriers, poor drainage, and failed waterproofing systems allow smaller quantities of physical water to leach in, or moist air to become trapped within the building envelope. Once inside, the water is adsorbed into building materials or into the ambient air, elevating the humidity inside our buildings. This excess moisture can lead to mold and other biological growth such as bacteria. Eventually, it can lead to rot and structural damage. 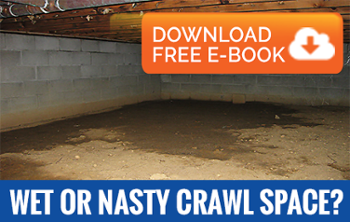 Crawl space foundations allow great access to plumbing, wiring, and duct work, but they can also trap moisture in homes and buildings. Since most crawl spaces have an exposed dirt floor, they allow ground moisture to evaporate from the earth and into the crawlspace, especially if they don’t have a vapor barrier. At AdvantaClean of the Midlands, we can assess and address the moisture source in your crawlspace. From a simple vapor barrier to our AdvantaSeal Crawl Space Encapsulation System, our team has a guaranteed solution to your crawl space moisture problem. Over time, even the best exterior basement waterproofing systems fail. They are difficult to service and nearly impossible to repair without expensive excavation. This leads to moisture intrusion through the basement walls and even standing water in the basement after a rain. Improper exterior grading or guttering can also contribute to the problem by not directing water away from the home or building quickly. From damp basement walls to standing water, and the mold issues that follow as a result, AdvantaClean of the Midlands can diagnose your basement moisture problems and provide recommendations for repair. Attics are designed to breathe by exhausting hot air and replacing it with cooler, fresh air from the outside. When they cannot ventilate properly, moisture can accumulate in the attic. The excess moisture eventually leads to attic mold growth. AdvantaCleanof the Midlands can evaluate your attic and recommend solutions from mold remediation to ventilation systems and other corrective measures.